Buying a Dog: Where Should You Get Your New Four-legged Friend? Buying a dog, rescuing, adopting, rehoming -- these are all terms that mean the same thing: Getting a New Dog. They all have different connotations and it is important to know the difference because each term denotes a different way to obtain your new four legged friend. Dog Shelters can either be municipal owned or operated by a private organization. Municipal shelters are city owned and often run by the local Animal Control. Stray dogs are brought to these shelters as well as relinquished pets, so there is a great variety of dogs from which to choose. Depending on the size of the city, these shelters can be quite large housing hundreds of dogs at any one time. The vast majority of dogs at the shelter are either medium to large breed dogs, especially Pit Bull mixes, so someone intent on a small breed dog may be disappointed. Many small dogs that are brought to these types of shelters are ‘rescued’ by nonprofit rescue organizations where volunteers agree to foster a dog until they can be adopted. Don’t assume that all dogs at shelters are mixed breeds. According to the Human Society of the U.S. about 25 percent of dogs are purebred. Locally run, private shelters or humane societies may be another option as they usually can hold dogs for a longer period. They may also have smaller breed dogs from which to choose, but the majority of residents will still be medium to large breed dogs. Adoptable dogs are spayed or neutered, micro-chipped, tested for heartworms and brought up-to-date on worming and any other health related procedures as needed. Most shelters will do a behavioral evaluation on each dog before putting it up for adoption, so you have some idea of personality traits. Your adoption fees cover the basic veterinary services provided for the pet so in terms of cost, buying a dog from a shelter is your most reasonable choice. The Shelter Project is an excellent place to start your search for a pet from a shelter. Type in your zip code and search for the dogs available in your direct area. Unlike animal shelters that are brick and mortar operations, rescue groups are run by individuals that locate volunteers to foster dogs in their homes. Many are breed specific or have a particular size of dog in mind. Rescues are often the best option for someone wanting an adult dog of a specific breed. They sometimes have puppies, but the vast majority of dogs are adults, some are seniors. Rescue Organizations have the dogs checked by veterinarians, spayed or neutered, and brought up to date on their vaccinations. They will also have their teeth cleaned, checked for heartworms and started on a worming program. Their charges vary from location to location and may be slightly higher than shelters. However, the fees still very reasonable when you consider you are getting a dog that is healthy and ready to go. Many of the dogs that are relinquished to rescue organizations are done so under no fault of their own: Their previous owners cannot keep them, there are landlord problems or the owners are relocating. Sometimes there are behavioral problems, but this is not the most common reason. If you would like to find a pet from a Rescue Organization, the website, PetFinder might be a good place to start. Buying a dog from a pet store may seem like the easiest way to buy a puppy, but this is the one place that I cannot recommend. 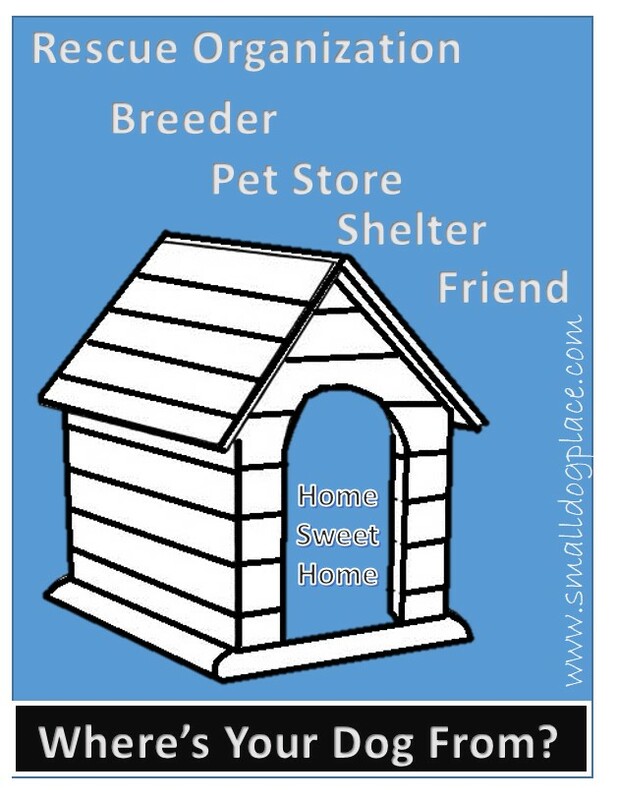 Pet stores get their puppies from two places: puppy mills and backyard breeders. Puppy mills can be small or large, producing puppies by the hundreds of thousands, selling them to brokers who deliver them all over the country to pet stores. Puppy mills are substandard at best and at worse; a living hell for the adult dogs forced to live in cramped cages with inadequate health care and exercise. Backyard breeds are another group of people who will sell to pet stores. You will never get a puppy from a reputable breeder from a pet store even though the store personnel will tell you the puppy came from a local breeder. Backyard breeders: Usually backyard breeders are people who have limited knowledge of genetics, dog health and nutrition, or best breeding practices. They may decide to breed their female because they found a friend who had a male dog. They may decide that breeding dogs are a way to make a little extra cash, under the table so to speak. They will sell the puppies in the local papers or online, but most do not maintain a website. Puppies from backyard breeders may be slightly better off than their puppy mill cousins, but still not have an appropriate start in life that makes them a well socialized stable pet. Do your homework before buying a dog from this type of breeder. Sadly, most puppies that you find in a pet store have been weaned from their mothers too soon, separated from the litter-mates, and trucked away as early as five or six weeks old. Pet stores must remove puppies early from their mothers so that they can arrive at the store ready to sell by eight weeks of age. Puppies do not learn the valuable lessons that should from their canine mothers, how to play with other dogs, or what it feels like to be handled by humans. They are at a definite disadvantage by the time they turn eight weeks of age. Puppies are never cheap because the pet store makes a profit; the broker takes his share, and the rest goes to the puppy mill. Sadly, it is many of these puppies that end up in shelters because the owners could not overcome the many problems that arise when puppies begin life is such a place. Many people mistakenly believe that they are rescuing the puppy from a puppy mill, by buying a dog from a pet store, but this could not be farther from the truth. Purchasing a pet store puppy just perpetuates the existence of Puppy Mills. If you have your heart set on a puppy or a particular breed, a reputable breeder is the obvious choice. All breeders are not the same, so it will take time to find one that has your perfect puppy ready to go. Most small breeders do not have puppies all the time, so prepare to wait. Purchasing a puppy from a breeder may be less expensive than a pet store, but can run you several thousands of dollars depending on whether you are looking for a very rare breed or a show quality puppy. Breeders usually specialize in one breed or two, but not more than that. Suspect breeders that always have a wide variety of puppies from which to choose. Experts always warn about buying a dog over the internet, but it is fair to say that the only way you are likely to find a good breeder is through an internet search. To determine the quality of the breeder you find, you should have plenty of communication with the person prior to the actual big day. Always have a list of question you wanted answered from the breeder. Reputable breeders are likely to have some questions for you, so be prepared. Assume that you will drive to get to the breeders home. This is an important consideration that should not be overlooked when searching for a puppy. Shipping is no longer an option for small in-home breeders because of new U.S.D.A. regulations. If the breeder does offer to ship, assume that she either has less than four female dogs of her own or holds a U.S.D.A. license. Breeders with very small operations may not have the experience needed. Those with a U.S.D.A. license are likely to be large commercial facilities where dogs are raised in kennels, not the breeders home. If you can find a breeder with puppies of your dreams within driving distance from your home, you are lucky. To find a breeder, do a search on the internet such as “toy poodles for sale in-----and name your state or province” or Check out sites such as Puppy Find. There is no “right” answer to finding the perfect dog for you, even if some advocates tell you that the only right thing to do is adopt from a shelter.